Topology Optimization in Engineering Structure Design explores the recent advances and applications of topology optimization in engineering structures design, with a particular focus on aircraft and aerospace structural systems. To meet the increasingly complex engineering challenges provided by rapid developments in these industries, structural optimization techniques have developed in conjunction with them over the past two decades. The latest methods and theories to improve mechanical performances and save structural weight under static, dynamic and thermal loads are summarized and explained in detail here, in addition to potential applications of topology optimization techniques such as shape preserving design, smart structure design and additive manufacturing. These new design strategies are illustrated by a host of worked examples, which are inspired by real engineering situations, some of which have been applied to practical structure design with significant effects. Written from a forward-looking applied engineering perspective, the authors not only summarize the latest developments in this field of structure design but also provide both theoretical knowledge and a practical guideline. 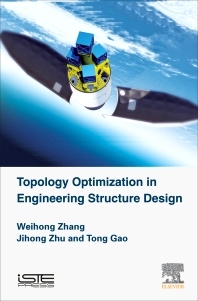 This book should appeal to graduate students, researchers and engineers, in detailing how to use topology optimization methods to improve product design. Weihong Zhang is Professor at the School of Mechanical Engineering, Northwestern Polytechnical University in Xi’an, China. He chairs the Laboratory of Engineering Simulation and Aerospace Computing (ESAC). His current research interests cover lightweight structure design optimization and manufacturing. Jihong Zhu is Professor at the School of Mechanical Engineering, Northwestern Polytechnical University in Xi’an, China. Tong Gao is an Associate Professor at the School of Mechanical Engineering, Northwestern Polytechnical University in Xi’an, China. His research covers a diverse array of problems in fluid mechanics and biophysics, with particular focus on active/soft matter, fluid-structure interactions, and multiphase flows. He is also interested in developing and integrating numerical methods to resolve multiscale physics in complex fluids.